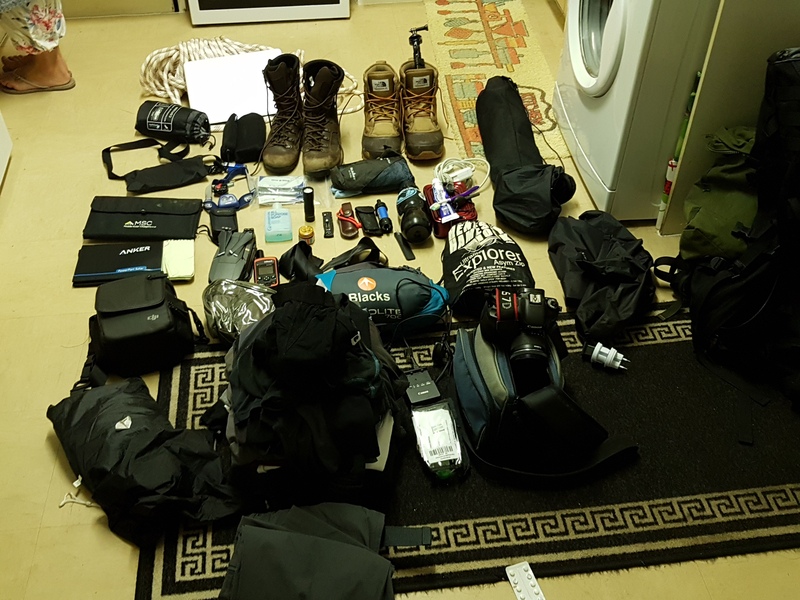 The equipment I choose to bring along with me I believe is paramount for me on a solo expedition lasting over a week, in the tropical forest environment. Solo meaning solo with nothing more than you and the stuff you carry. Hard wearing outdoor trousers any outdoor shop will have them fast drying. A wide brim hat helps keep the sun off your head and reducing the risk of potentially dangerous heat stroke. Boots are again a serious consideration, with me it was trial and error I am now a happy owner of a pair of lowa elite jungle boots. These boots will last me a lot of expedition steps and arduous climbs through swamps and rivers and they need to be up to the challenge please seek out advice and when a decision has been made take them out up the hills and put them to the test. Head torch any Petzl one will do just fine and then, of course, a back up one with extra batteries. Sleeping bag light as possible but adequate for the job of camping in the tropics my chosen system is a snugpak option. Dry warm clothing every night I would need to change into my dry kit and get the best nights sleep I could the dry kit is essential for this and maintaining your health, for example, sleeping in wet socks for even a night can cause soars to become infected. Rendering whoever pretty useless for trekking in the tropics. Drone, drone remote, 3x batteries wires and more wires. 3x Anker power banks Absolute lifesavers. Tripod for the more creative shots. Macbook pro 13 inch plus the wires to charge. Adapters from British plug to local plug. 2x solar panels to recharge the power banks. Emergency GPS locator beacon and tracking device. Water filtration system water to go bottle perfect for any type of water on the move. Also, a backup of filtration lifestraw is also ideal. Any medication prescribed such as malaria prevention. Individual medical kit and know how to use it. A machete bought in the country of travel. A means to dry your feet talcum powder perfect addition to any multi-day trek. A number of dry bags to keep the equipment dry. Bonus items a way to raise the morale of any adventurer. A means to listen to music, an example I was stuck in the Corcovado national park in Costa Rica Pacific coast. Where I had struggled for maybe 3 days soaked through bitten to death by anything breathing oxygen or scratched by any tree or even razor grass. I sat down and played it that night. With all this equipment a means to carry it is also essential, military-grade backpacks or bergens with a way to modify them such as PLCE webbing. I opted for the leader in the design of backpacks, for a huge expedition and that was a karrimoor sf backpack.